Tim Dilks studied at the Coleraine campus from 1968-1972 and again in 1974, graduating with a BSc and DPhil in Biological and Environmental Science. 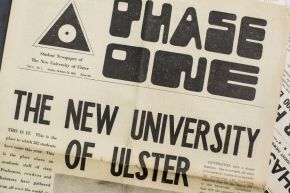 I arrived in Coleraine in September 1968 as one of six new postgraduate students in the School of Biological and Environmental Sciences. We were given room B252 in the phase one building. My supervisor was Professor Newbould and I spent four years working on a raised bog south of Maghera. I shared a flat above a hairdressers, which later became a chip shop, on the promenade in Portstewart. One of my claims to fame was captaining the first NUU cricket team against Coleraine Academical Institute in 1969. It was on cup final day, when my team Leicester City were playing Manchester City, so the game had to finish in time for me to get back to the university for 3pm! We decided on a limited over game. I can’t remember who won, but I made it for the kick off and Leicester lost 1-0! I played rugby for the 2nd team in 1969 and captained the 3As between 1970 and 1972. I left in 1972 to become a Research Assistant at Exeter University for three years and then taught for thirty-nine years in secondary schools.